Warning: Calling that number will not actually yield free stickers. 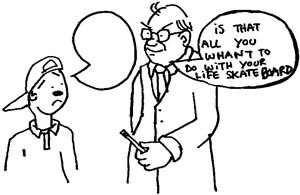 Remember being a kid, scouring the fine print of skate company ads, looking for numbers to call and leave a message for free stickers? Considering we’ve been around for the better part of a decade, and this is the first time vinyl decals with the website’s name exist, we’re running a similar promotion. 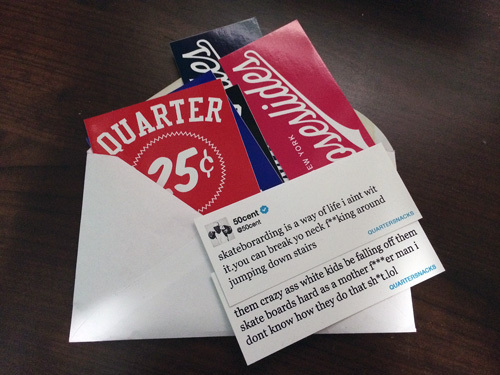 E-mail qs.stickers [@] gmail [dot] com with your mailing address, and we will ship you out a free sticker pack. This is limited to people in the United States. Sorry, Europe. (The same sticker pack will be included with every web store order when we are restocked with holiday gear in several weeks, international or otherwise.) There are a hundred stamped envelopes, so e-mails will stop being fulfilled after those run out. We’re at way over 100 requests now and running out of envelopes. Sorry to anyone who missed out. They’ll be at shops soon enough. Otherwise, you can get them with web orders or at shops that carry QS gear. The post will be modified if the demand gets too high. You’re good now though. We love Canada, but apparently the U.S. Postal Service doesn’t because shipping options there are still awful. When does the new gear drop? Trying to cop B.
I mentioned those in the original draft of this post. However, it’s not possible to work in a 281-330-8004 reference when discussing SASEs. Please make shipping to Europe! The SASE and a “dollar for stickers” days are missed.